Catapultae are the heavier arrow projectors in the Roman army. They can cause more damage and are more generally more flexible in use, but are slightly slower to reload, less mobile and can’t achieve the scorpiones range. Catapultae are heavy arrow projectors firing in flat trajectories similar to the scorpiones. Their maximum range is only slightly lower than that of the smaller pieces, but it still surpasses all hand held weapons at ease, while their bigger projectiles can cause much more damage, making the weapon a more versatile alternative. Together with incendiary shoots it can be used effectively against enemy ships, siege engines and ordinary buildings. In naval combat it can also launch the harpago, a kind of long range grappling hook to ease the boarding of enemy vessels. The price that has to paid for the increase in flexibility and firepower over the scorpio is the vastly increased size of the engine. Catapultae are slower to reload, more difficult to transport, deploy and it’s not as easy for the operators to adjust the large frame for better aiming than the scorpion’s. In action torsion engines generate a very distinct noise, that adds to the demoralising effect these machines already have on an enemy unfamiliar with artillery, when he comes under fire at greater distances than usual. All currently used Greco Roman artillery pieces are constructed after the same basic design as two armed torsion powered engines. The torsion springs itself are made of densely packed and drilled animal sinews and human hair, they are used to store the energy until the weapon is fired. The inner ending of the two arms is directly connected to the springs, while the others are attached to a rope that runs to the carriage holding the shoot. When the weapon is loaded the operator push back the carriage, with the help of a winch to master the high forces, so that the springs are twisted. When the piece is released they will move back to their original state and transfer the stored energy to the projectile. 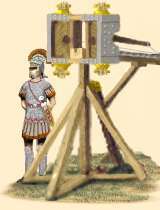 Historically, in the second or third quarter of the first century BC the Roman army introduced a new generation of tormentae , as the Romans called the torsion powered artillery pieces. This first genuine Roman designs, based on centuries of experience with such weapons in the Mediterranean world and some innovations of their own, proved to be a great improvement over the previously used old Greek variants. The engineers had optimized the design of the frame and the two catapult arms so that more energy could be stored in the springs and thus transferred to the projectile, giving it higher range and penetration power. These new construction was described the first time by the architect and engineer Marcus Vitruvius Pollio, who was part of Gaius Julius Caesar engineer corps overseeing the production of his army’s tormentae and probably participated on their development itself. In the late 2nd century BC artillery became more regularly used by roman armies to provide the urgently needed barrage fire during siege assaults as well as to defend own fortifications. In the following decades tormentae became a standard equipment of the now more permanent legions, build and maintained by their own engineers. The late fourth century military theorist Vegetius reported that finally every legion had one arrow thrower per centuria and one stone thrower per cohort and thus around 70 pieces available, but this was apparently not the case in the late Republic and early Principate when numbers were somewhat lower. Exact numbers are known for the Jewish war in 67 AD when each of Vespasian’s legions was equipped with ca. 54 tormentae. Now Roman commanders quickly developed new tactics and made extensive use of their artillery outside traditional siege battles to assault or defend forts and field fortifications, provide fire support for amphibious landings or river crossings, keep enemy archers at distance and even in pitched battles. A development that climaxed in the creation of a truly mobile field artillery with the introduction of carroballistae and other lighter advanced designs into the imperial army around 100 AD.